Mix cream cheese, egg yolk and 1/2 cup sugar thoroughly. Divide the mixture in half and stir in the strawberry jam in one half and the blueberry jam in the other half. Trim the crusts from the sandwich bread and roll each slice flat. Spread half of the bread slices with the strawberry cream cheese mixture and the other half with the blueberry cream cheese mixture. 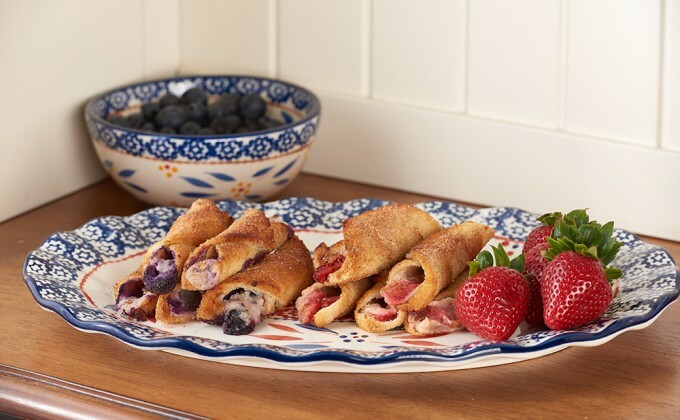 Top the strawberry batch with strawberries and the blueberry batch with blueberries. Roll each slice corner to corner. Mix remaining one-half cup sugar with ground cinnamon. Quickly roll sticks through the melted butter and then through the cinnamon sugar. Bake 20 - 25 minutes until lightly browned. Cool on a rack. Garnish with fresh strawberries or fresh blueberries and serve.